This article by Ari Raziel first appeared in the February 2004 Edition of the Jewish Magazine. Tu B'shevat is a holiday that is not a holiday, or perhaps, more correctly, a non-holiday that is a holiday. Unlike all of our holidays, there are no proscribed customs and prohibitions associated with this day, except we do not say tachanun, a prayer in which we beseech G-d for his mercy which is recited immediately after the silent Amidah, the standing prayer. There is also the custom of eating a new fruit and many have developed the custom of eating fruits which the Torah mentions in conjunction with the praise of the Land of Israel. Tu B'shevat is not mentioned in the Torah. It is mentioned in the Mishnah which tells us that there are four Rosh Hashanahs. The first day of Nisan is the Rosh Hashanah for the counting of the years of the reigns of the kings of Israel. Meaning that when it says in the second or third year of the reign of king so-and-so, it counts these years from the first day of Nisan. In addition, the first of Nisan, is considered the beginning of the first of the three pilgrimage festivals: Passover, Shavuot, and Sukkot. The second Rosh Hashanah is the first day of Elull. This is the first of the New Year for the tithing of animals. All animals which are born before the first day of Elull are tithed together, whereas animals born from the first of Elull and afterwards are placed in a separate group to be tithed. This means that an animal born in one year may not be taken as a tithe for an animal born in a different year. The third Rosh Hashanah is the first of Tishri. This is the date that we all know as Rosh Hashanah. Not only is it the Rosh Hashanah for all mankind, but also the counting of Shmitah (the sabbatical year) and the Jubilee year (the fiftieth year). Tu B'shevat, which unlike the others does not start on the first of the month, but rather the fifteenth, is the Rosh Hashanah of trees. This applies to the different tithes which were obligatory during the time of the Temple, and now as a Rabbinical commandment. The sages have reckoned that the fifteenth of Shevat is the border date in regard to fruits. Fruits which have realize a third of their growth by Tu B'shevat are tithed on the previous year. 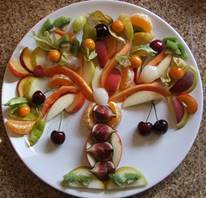 Fruits which have not reached a third of their growth by Tu B'shevat are tithed on the following year. The sages explain that by the fifteenth of Shevat the soil is saturated with the rains of the passing winter so that growth is assured for the New Year. Therefore any tree planted before Tu B'shevat is considered as belonging to the previous year. Since Tu B'shevat is related to trees and the fruits of the tree, the custom in Israel is to plant trees on this day. Many however see in Tu B'shevat mystical references to deep kabalistic secrets. This is comparable to a person, since the Torah compares a person to a tree. Three things are needed for a person to give forth the fruit for which they was created: the Mitzvot. First, the ground is needed for a person to live upon, which produces all of a person's needs. The second is the person themselves, who must take from the ground material to make a mitzvah. But without the third ingredient, the word of G-d, nothing can start. It is difficult for a person to take a rock or a cucumber and perform a mitzvah. The mystical sages told us, that the word of G-d fell down into the earth when G-d began to create the worlds. This is called by the cabalists as "tohu". Now tohu has a tremendous power. Like the power of the atom in uranium, this power consists of holy sparks, "nitzuzim" which fell down to the lowest level during the six days of creation. Since then, G-d has given us the Torah which is compared to water. Through the Torah we are able to reach down to the material and elevate it up. This is the mitzvah; this is the fruit of a person's creation. Since it is the land of Israel that we yearn for and love, we combine the two: the fruits and the mitzvahs. We find new fruits that we have not yet eaten this year and we make the blessing "shecheyanu", "Blessed are You, Lord our G-d, the King of the universe, who has kept us in life and provided us with sustenance, that we have come to this time." In this manner we combine the aspect of the tree, which is giving its best, its fruit, to the aspect of man giving his best, the mitzvah of the recognition of G-d's goodness in our world.